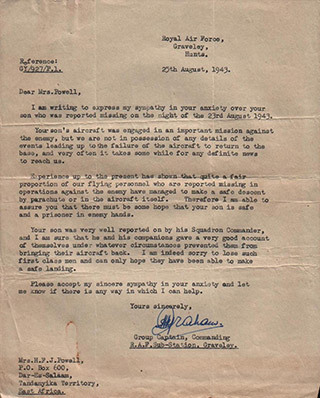 I am writing to express my sympathy in your anxiety over your son who was reported missing on the night of the 23rd August 1943. Your son’s aircraft was engaged in an important mission against the enemy, but we are not in possession of any details of the events leading up to the failure of the aircraft to return to the base, and very often it takes some while for any definite news to reach us. 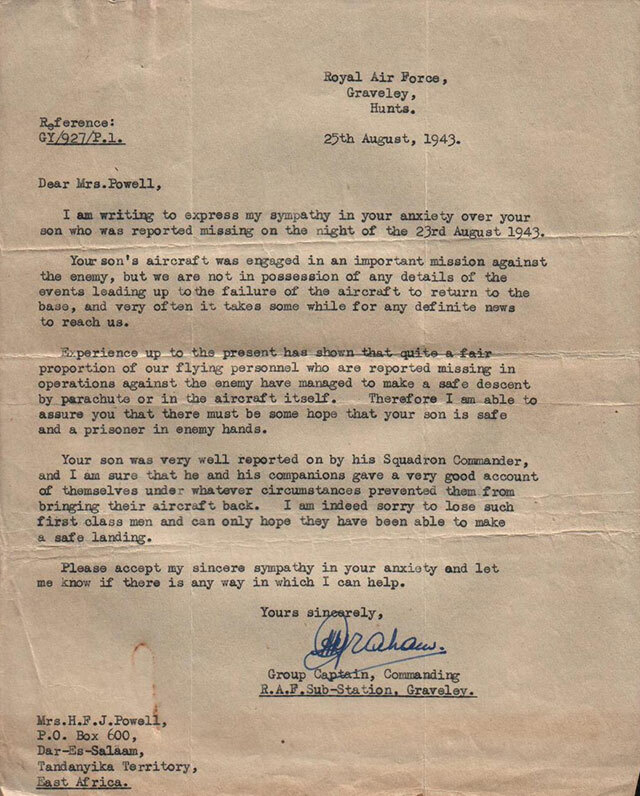 Experience up to the present has shown that quite a fair proportion of our flying personnel who are reported missing in operations against the enemy have managed to make a safe descent by parachute or in the aircraft itself. Therefore I am able to assure you that there must be some hope that your son is safe and a prisoner in enemy hands. 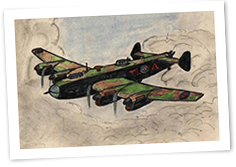 Your son was very well reported on by his Squadron Commander, and I am sure that he and his companions gave a very good account of themselves under whatever circumstances prevented them from bringing their aircraft back. I am indeed sorry to lose such first class men and can only hope they have been able to make a safe landing. Please accept my sincere sympathy in your anxiety and let me know if there is any way in which I can help.